It’ll be great to see where this goes in the coming years, and when we can get Linux-capable RISC-V chips for less than a kilobuck. You and me both. I have a debit card, its limit is AU$999.99. I’ll bet the $999 figure is USD. The only ways I could buy this is by telegraphic wire transfer (been there, done that) or bitcoin. You can typically overpay a card in order to be and to me bigger payments with it. I did it to buy a laptop once: put 600$ on the card with a 0 balance the but the 1600$ laptop even if the card’s limit is 1000$. I tried that making parts purchases, and it didn’t work at all. It helped with multi-day purchasing, but the card would not allow more value in pending transactions than the credit limit. I called the card people up, and they said I could not “superinflate” my card, and acted like I was trying to do something shady. WTF. ‘telegraphic wire transfer’ Really? You mean ‘wire transfer’ or ‘bank transfer’, which I read in the US and such can take days or weeks, whereas in the eurozone you just press a button on your electronic bank system and it’s there in no time (day or two tops? ), and no fee either in most cases. I shudder to think how long such a transaction takes from AU to US and how much they charge you for doing a basic thing. It was from my bank (Suncorp) to a bank in China. “Telegraphic wire transfer” was what was written on the form that I filled out at the bank branch, and involved requiring SWIFT codes and lots of other details of the recipient. I think the process cost about AU$30 or so. This is different to “electronic funds transfer” where all you need is the BSB, account number and account name… and yes, I do the latter variety all the time. From the picture it looks like its build like a tank. Just the color and layout I think makes it look very rugged. But I guess at that price I don’t think so. I will have to wait and play with my little CPUs and MPUs. Judging from the DIP switches up the top, the array of SMA sockets all wired up to clock lines and the small header down the bottom left for power measurements, this is not a home hobby development board. This is what dev boards often used to cost years ago… hideously expensive unless you’re a business. Hopefully, as interest picks up, demand for that SoC will go up and the unit cost down. With that, we should see some more reasonably priced hobby boards. Someone like WD could use the U540 SoC as a mass storage controller. Why would they use someone elses instead of designing their own, customized for their own requirements? WD have already started producing RISC-V chips and will be using them in most of their products from now on. You can almost sense the fear of “but no one will like me and come to my parties if I admit it’s all about the money”. RISC-V is a nice thing, but at the end of the day it’s still a processor. I saw a WD network drive on sale and it had the warning that it uses non-standard drives. Would be pretty sad if WD uses this to mess up the standard SATA or M2 interfaces and such, just to be annoying. Sifive are not releasing the designs anymore. So yeah, it may be riscV based but story of the instruction set aside, it’s no different than your regular ARM processor or your 80xx based micro. They’re also not trying to sell computers, they want to design (and fab?) chips for customers. yes, the price tag is way too high to suggest they want hobbyists to ever buy one, this looks like very low volume purchases by business customers, kind of like a demonstration unit, the price will probably never come down. The price goes down with volume. That’s just how things work with silicon. The price will go down only if it takes off, demands must go up and fabrication must increase in efficiency. It’s got the open source thing going for it, so this will be a plus for people still concerned with the latest processor insecurities, maybe. They may not be targeting the average piddler, but maybe some larger groups more concerned about total control over security that off the shelf operating systems and hardware do not supply. It would nice if a comparison of, say, some linux code running on it verses an off the shelf processor. Maybe there is, I didn’t look into details of this once I saw price tag and linux. The thing is though that once you made the mold and set up the whole design for said 28nm then you MUST try to sell a lot to cover the setup cost right? So you should go as low as possible. It’s not like you can only make 10 chips. Hell even with designing and ordering PCB’s it’s cheaper to buy a certain minimum amount. Seems to be some important differences in the instruction set. Someone is pushing really hard for SATA to stay away from these tiny systems. Those were the only embeddef systems with a decent way to store stuff. Back to our days and latest embedded tech available. No more SATA on board? No SCSI? No IDE? Not even PERTEC? Just USB? [CENSORED]!!!!!!!!!!!!! How about a PCI-E slot? The Banana Pi (Allwinner A13) has SATA, native Gigabit ethernet, multiple USB host ports, and is less than $50. It is safe to say that I will be grabbing popcorn in a year or two to watch when this speeds up a bit. Part of the link above worries about fragmentation. Sometimes things can be so open where their digital brains fall out. The first revisions of a chip of that complexity is going to be so buggy it would be suicide to release a hobbyist board. In a year or so it’ll be ready for general consumption, after the worst bugs have ironed out both from the hardware and operating system support. Where is the PCIe connector? The PCIe is right next to the SATA port. Most of the comments here seem a bit short sighted. This board clearly not meant as a development board for use in developing projects. 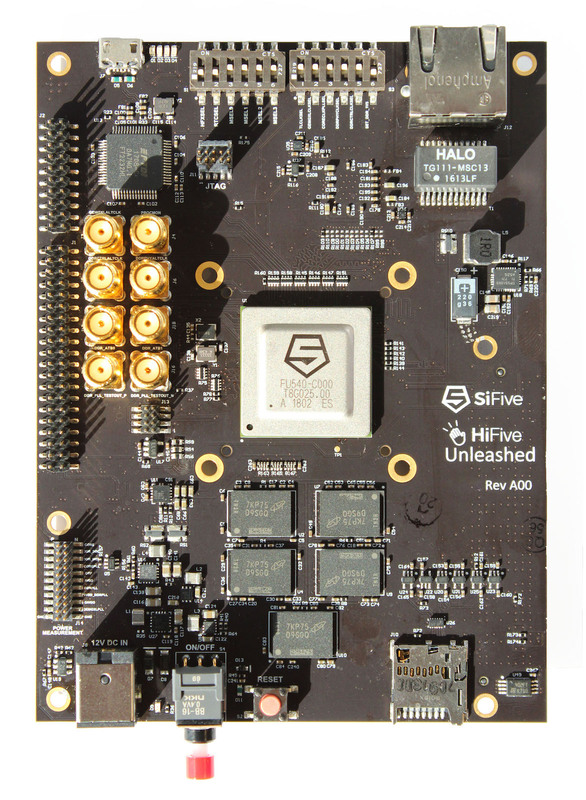 This board is designed as a development board for debugging the processor architecrute and getting it to run any software reliably. Look at the big power measurement connector. The other connectors are probably also not meant as “general I/O” such as all the mini boards hobbyists are used to, but probably more a convenient place to add a logic analyser to debug the board furter. Prices can and will only go down with mass production. What are those RF connectors for? Does anyone know? Going by the silkscreen labels, they’re for measuring the various DDR clocks.